My son struggles in school. A lot. He went on an IEP in kindergarten for a "learning disability." By first grade I had taken him to a neurologist and he was diagnosed with ADHD. I experimented with medication for him, cried myself to sleep many a night, had more meetings with his school and teachers than I can count and still...Tyler struggled. By second grade Tyler began hating school. He could barely read and still couldn't add. His writing was arduous and not able to be read. He began losing hope. In the beginning of third grade, he was reading two grade levels behind and he couldn't add beyond a sum of 10. His writing looked more like a kindergartener's than a third grader's. His peers were soaring and he was stuck. His heart was breaking and mine was too. By mid-year of third grade, he began telling me he wanted to die. He said he'd rather die than have to keep trying to read, write, and do math. I asked him if he knew what that meant and he said "I would go to heaven and I wouldn't have to read and do math anymore." My heart continued breaking. All the testing, meetings, doctor's appointments and still...we had no answers and Tyler was sinking into an abyss of feeling like a failure. He felt like he had nothing to contribute to the world and he is only 9 years old. When the second round of testing from a neuropsychologist this past April revealed that Tyler has dyslexia, dysgraphia and dyscalculia, we cried. We cried with relief. Tyler learned what I knew all along, but Tyler had to hear for himself. He's not stupid or dumb. He just learns in different ways. He is still learning what this means and what it feels like and looks like on a daily basis. We talked about what dyslexia is, what it looks like, and what it feels like. We talked about people we know in our daily life who have it, celebrities who struggle with it, and what it means to be dyslexic. Tyler tells people who ask him why he goes to a different school now and he says, "I'm dyslexic. I just learn in different ways." Knowing that there isn't necessarily something wrong with him but maybe, perhaps, something wrong with how we teach, has helped him understand his own challenges. Wow! To be able to get to the core of who you are at such a young age is pretty amazing. After years of struggle, we finally had our victory and Tyler began a new school in May. The school has a program for students with language learner delays (such as dyslexia). Tyler is one of 4 students in his class. I thought this would be hard for my sociable and outgoing son, but for the first time I have heard things like "I feel relieved, Mom" or "Mom, I'm learning more now than I ever have in my whole life." I never thought I'd hear such words from my child. He is learning that learning can be fun. It doesn't always have to be hard. He has been given a gift. My dream for my TPT store is to continue to create educational materials that motivate and inspire. Maybe that will be a teacher. Maybe it will be a student. Maybe it will be a student like Tyler. How amazingly awesome is that? Creating has allowed me to reflect on my own teaching. Am I teaching to reach all learners? Are the activities, projects, and lessons differentiated to meet the needs of all learners? This is so important to me. I know what it is like to struggle in school. I also know what it's like to have a child who struggles in school. I also know how awesome it feels when you "find your niche" and then learning isn't so much hard work anymore. It becomes fun and it becomes fulfilling. My dream for TpT is to be able to continue to have this amazing opportunity. My dream is to make learning fun for students and for teachers. May it always be fun! May it always motivate and inspire someone else and myself. Creating, selling, and collaborating with so many talented, creative, and inspirational teachers, bloggers, and sellers has given me the confidence to know that my contributions to teaching matter. No matter what the scores on the myriad of assessments I give over the years, learning should always be fun. My dream is that it always will be. Thank you to Sparkling in Second, Teach Create Motivate , Third in Hollywood, and Peppy Zesty Teacherista for encouraging us to share our dreams. What an inspiring, amazing, beautiful story and dream! So happy that you have found a good school for your son. I hope he continues to have success and that you have continued success on TPT. Awww thanks so much. You are so sweet. I have been very blessed to have a great support network of friends and other bloggers who have given advice and offered kind words (like you did here) and it has helped me in sooo many ways. Your story helps remind me that I need to reflect on my own teaching. My brother was like your son, but when he was in school it was much more difficult to get an answer. He was in his senior year of high school when they told my parents he had comprehension problems, ADHD, and other problems. I am so happy to know that things have progressed so much. TPT is truly an awesome place for us teachers to get so many wonderful resources we would have never had access to before! Thanks for sharing and best of luck with your TPT journey. You are so kind. Thank you so much for your sweet words. My brother has autism and I often wonder how my parents did it back in the early 70's when there was so little information and support. You are so right that TPT is such an awesome place to share products. It's also so awesome to know there are sweet people like yourself who reach out and say hello and offer kind words. I feel so blessed to be reading these comments today from you and other bloggers. Wow! I really feel the love! This is my favorite blog post i have come across in this link up. Such a lovely post and thank you for sharing a part of your family life. I love your goals and i'm sending you all the luck in the World for the continued growth and success of your TpT store. Ok....I'm going through these comments and I'm just a mess over here. Tears of joy at all the kind words. You are so sweet. I don't even know what to say. I was scared to hit the "publish" thinking hat people would pass judgement, maybe. I'm just so overwhelmed with all these kind thoughts. Thank you so much. Your kind words mean so much to me. Thank you for sharing your story and your dreams. I remember reading your post about your son changing schools on the TpT forums and I'm thrilled to read he is loving it and making progress! yay!! Oh my goodness. Yes! I remember that! Thank you so much. I know it was all the support, love , and encouragement I have received for teachers like you all who as fast becoming friends. Sometimes it's a simple comment, a kind word that can really help someone through a tough time. Thank you. I will pay it forward. Love your goals Julie! Thanks for sharing such a personal story - your son is SO lucky to have you! Molly, you are just the sweetest! Thanks so much. By the way, are you going to Vegas? I'd love to meet you! Your post makes it clear that you are a teacher for all of the right reasons. I hope that you know that you've already succeeded at inspiring because this post will be inspirational for anyone who reads it. Rachel, I can't imagine a higher compliment. I don't even know what else to say. Thank you. Julie, Words cannot describe how happy I am that Tyler's journey made a turn. You are an inspiration to me as a mom. I'm glad that I get to call you friend. One of the greatest gifts I have received in this journey is to have you as one of my dearest friends. Although distance separates are you are near and dear to me, always. To think it all started with an Instagram comment and now here we are. Sometimes I think I talk to you/text you more than my husband. :) You're a wonderful friend. MUAH! 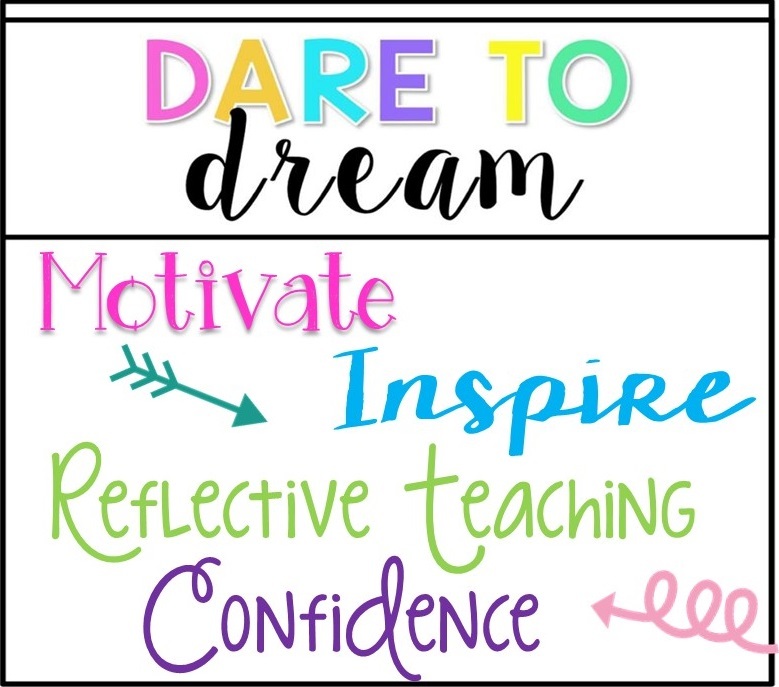 I've been following the Dare to Dream discussion, and I just want to tell you how much I loved this very real, very important purpose to what we do on TPT. I feel exactly as you. It is amazing to me that the things I make are being used with kids many localities, some near and some far. I love that, and I love that my work is helping make the lives of other teachers easier. Your post was inspiring, Julie, and I wish your little guy happiness as he learns. He will get there. My daughter with special needs will too. It will be on their timeline, but that's okay. Best wishes!